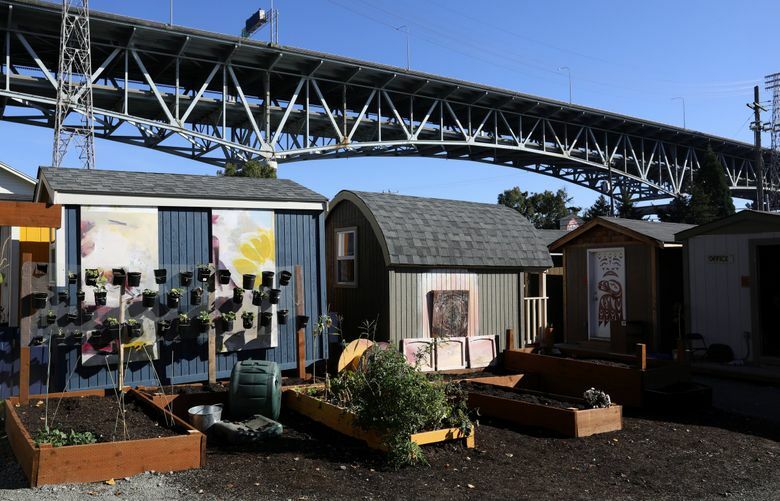 Padlocks now hold the gates at three tiny-house villages for homeless people in Seattle, as a dispute over who should run the villages has escalated. The locks, installed by allies of the activist group Nickelsville, are intended to exclude staff from the Low Income Housing Institute (LIHI), a Seattle nonprofit contracted by the city to provide case management to homeless people in the villages, from city-sanctioned sites in Georgetown, Othello and Northlake, in Wallingford. The villages, managed by Nickelsville, aren’t allowing staff from LIHI inside their camps unless they are case managers “who are actually here to case manage, not here to make trouble,” according to Peggy Hotes, a longtime volunteer and one of the founders of Nickelsville. At least one case manager at Othello Village left last week after a dispute led someone at Nickelsville to call police. The case manager left before they arrived. Nickelsville leadership says fire and emergency medical services can access the villages easily. This is a hiccup in the city’s response to a growing crisis of homelessness, which has over the past four years included opening nine tiny-house villages as an inexpensive, stopgap response. But the villages have proved hard to site because of neighborhood concerns, hard to move as tents were replaced with “tiny houses,” and hard to manage as infighting has broken out between LIHI and Nickelsville. LIHI wants residents of the villages to be required to meet regularly with case managers; Nickelsville does not. The groups are also fighting over who should have the power to kick someone out of a village. Unable to come to an agreement after months of dispute, LIHI cut pay for Nickelsville staff and demanded they turn over rosters, phones and documents last week. It is unclear what the city of Seattle is going to do. The city has given statements supporting LIHI during “this transition of management,” and Lily Rehrmann, a strategic adviser for the city, said if residents don’t want to agree to LIHI’s new code of conduct, “then unfortunately they have to go.” She didn’t give a hard deadline or a plan of enforcement. “We want the residents to know that even if they don’t agree with the city … they’re welcome to stay if they’d like to stay,” Rehrmann said. Nickelsville’s lawyer issued a cease and desist letter to LIHI Executive Director Sharon Lee on March 23, and around March 27 Nickelsville padlocked the gates to the villages and turned LIHI staff away, as first reported by a Wallingford community blog, Wallyhood.org. LIHI staff have called police a few times, but officers have not tried to force their way into the village. Jason Johnson, the interim director of the city’s Human Services Department, sent a letter last week saying the city supports LIHI’s “efforts to bring more consistent and transparent management measures to these village sites.” There was no explicit warning about Nickelsville’s padlocked gates. Nickelsville’s leaders have fought with Seattle government in the past; they named their camp Nickelsville in 2008 after former Seattle Mayor Greg Nickels to protest his cleanups of homeless camps. In the background, the city has been moving away from funding Nickelsville’s sister organization SHARE in recent months. Scott Morrow, who has helped run activist groups like Nickelsville for decades and has been at the center of several controversies, said this is not just infighting between two organizations, but rather an effort from the city to sideline homeless activism, according to an open letter to The Stranger. The city is “deputizing Sharon Lee of LIHI to do their dirty work for them, so (Seattle) can stand above and pretend this is just two agencies fighting,” Morrow wrote. It’s not yet clear what will happen. 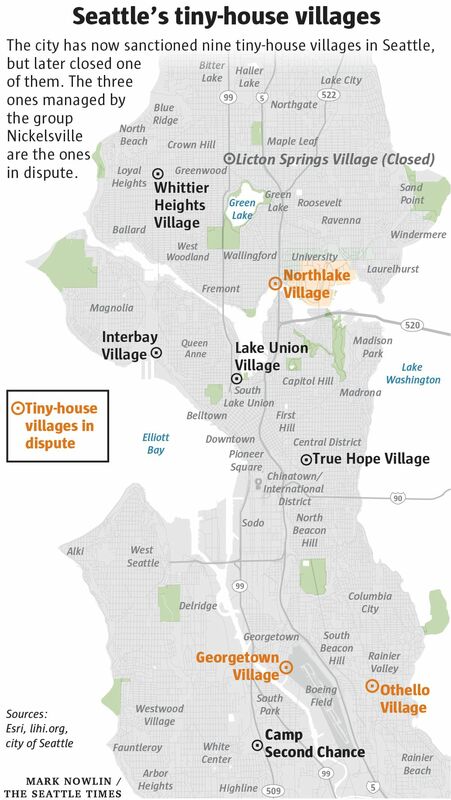 Nickelsville’s villages are on land owned by the city or LIHI, but Nickelsville argues that they are abiding by Seattle’s 2015 ordinance authorizing tiny-house villages. Hotes says that Nickelsville leaders hope it doesn’t come to legal action, but that Nickelsville is willing to go down that path if need be.